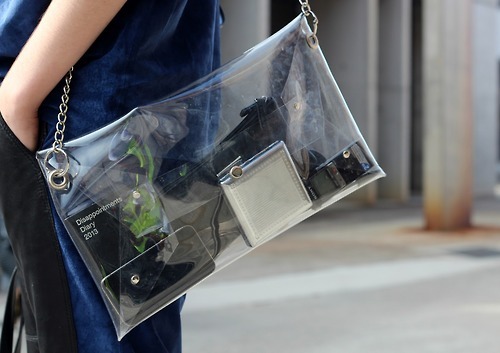 This past spring (with more to come in 2014) there was a ‘clear’ message from the fashion designers that my mind keeps going back to … the come-back of the see-through bags. A trend I did not immediately embrace though, as I know myself and carefully curating the contents of my bag is not one of my talents unfortunately. Nevertheless I decided this trend, like all trends, can be for just anyone. What attracts me most is that this one simple basic gives you the opportunity to match it with every single outfit, no matter what occasion. It’s you who decides whether you want to make a huge statement, color coordinate it with your outfit or simply flash some of your eye catching belongings. It’s the inside that counts. Good reason to find yourself a new Iphone case, cool sunglasses, fancy lipstick and a matching wallet.